Ebay, one of the popular eStores is offering great discounts on popular gadgets on a daily basis. Today, the store has a bunch of Apple products along with few other products from popular brands on sale with possibly the best deals you could find around. Today’s deals offer unlocked 16 GB iPhone 5 for a discounted price of $624. Similarly, the MacBook Pro carries a price tag of $1030 and it is by far the lowest we have seen in the market. The list of discounted Apple devices include iPad Mini and iPad 4, much for the buyers’ joy. 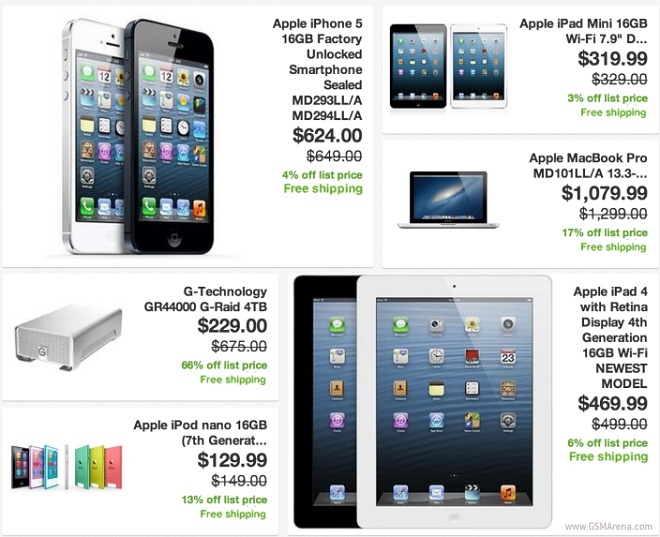 Ebay also has a bunch of other Apple products available at a discounted price. Along with the discounted price tags, Ebay also offers free shipping for these products. Ebay offers its buyers with a wide range of payment options and the sales tax is charged only in California. Check out the exciting offers in the Ebay Daily deal section.